FAYETTEVILLE, Ark.— The City of Fayetteville and University of Arkansas have partnered with VeoRide, Inc. to bring the region’s first bike sharing program to residents and visitors of Fayetteville. Fayetteville City Council unanimously approved a contract on Tuesday evening with VeoRide to be the exclusive bike share provider in Fayetteville. VeoRide, Inc. was founded at Purdue University in West Lafayette, Ind., and offers bike share programs in almost 20 cities, with a focus on college communities. The University and City staff created a joint request for proposals in April 2018 and unanimously selected VeoRide from four proposals. The City, University, and Experience Fayetteville (convention and visitors bureau for the City) worked together, negotiating a contract with VeoRide, to reduce costs. Discounted membership fees will be available for qualified low-income individuals as well as students, faculty, and staff of Fayetteville Public Schools, private schools, and the University of Arkansas. Non-members may also check out bicycles on a per ride basis. VeoRide will offer free rides during the first two weeks of the program. Afterwards, riders pay 50 cents per 15-minute ride. Unlimited one-hour rides will also be available through monthly and yearly memberships. While most bike share programs require use of smartphone apps and credit cards, VeoRide’s system offers alternatives. More details will be available in a few weeks. The bike share program will launch in September with 290 standard 7-speed bicycles and 50 “e-bikes.” The e-bikes make pedaling uphill easier through a pressure sensor in the bike pedal that triggers the electric motor. Because of the City’s terrain, VeoRide expects to add more e-bikes in 2019, depending on market demand. The fleet will be uniquely branded featuring Razorback colors with logos of the University, City, and Experience Fayetteville. VeoRide is a dockless bike sharing system using geo-fencing technology which aids with bike parking, locations for pickup and drop-off, and perimeter tracking. Other technology systems will help an operations team maintain the fleet, resolve customer issues, and provide data to improve the program. VeoRide has already hired a local full-time manager, who will hire additional full- and part-time staff. The City and University have been researching the feasibility of a bike share program for about four years. Both wanted to promote transportation alternatives and offer opportunities to enhance recreation, sustainability, and community wellness. Enhance and support public transportation. Goal: Endeavor to create an inclusive multi-modal transportation system. Goal: Partner with advocates to address bicycle and pedestrian needs. Action Item: Explore possibilities of developing a “bike share” program with outside help either locally or regionally. Establish a community-wide bike share program. 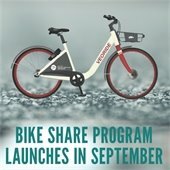 A joint effort between the City and the University of Arkansas for a citywide bikeshare system that would replace the existing Razorbikes system is in the development and planning stages. Implement a community bike-share program. VeoRide is currently working on a website dedicated to the Fayetteville program. The company’s proposal provides an overview and can be found on the City’s website at www.fayetteville-ar.gov/bike. Copyright © 2017 City of Fayetteville, Arkansas. All rights reserved.